Said Baalbaki, “Mon(t) Liban” (2014/15), exhibition view, Positions Berlin 2015. Photo courtesy of the artist. Amidst some rather crammed booths, the more spacious and carefully curated exhibitions really stand out, like that of solo show by Said Baalbaki. 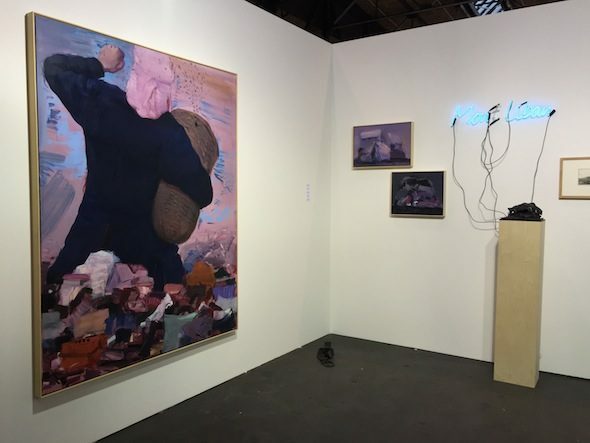 Baalbaki’s painting and sculpture installation features a series of pink and purple hued paintings depicting piles of suitcases and clothes, a motif repeated over and over in his work like a recurring dream. Baalbaki’s imagery draws from memories of growing up in Lebanon during the Civil War, often uprooted from place to place. Most of the paintings are devoid of people or specific landmarks, the isolated stacks of belongings symbolic of insecurity and vulnerability. The one figure, a bee keeper in military uniform, Baalbaki describes as a symbol of colonial power, beekeeping acting a metaphor for colonisation. 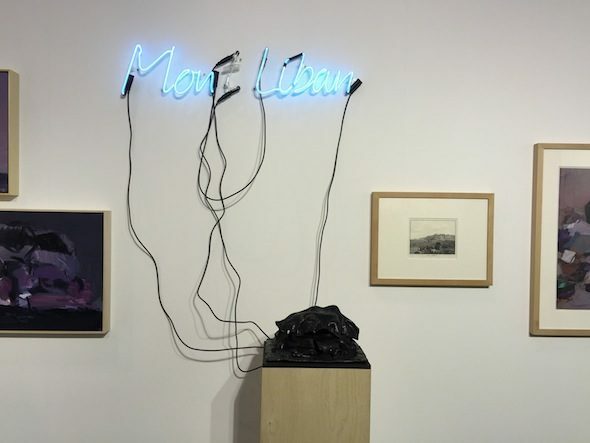 The title of the installation, Mon(t) Liban, hangs among the paintings in neon lights, layering the works with irony. A small bronze sculpture of a stack of belongings under a blanket mimics the silhouette of Mount Lebanon. The sign is a pun in french, saying these memories of war are “my Lebanon”. In light of the current refugee crisis, Baalbaki’s imagery of fleeing, of homelessness, and of uncertainty feel particularly poignant. Nina Hannah Kornatz and Marie-Luise Meyer, exhibition view, Positions Berlin 2015. Photo courtesy of Kunststiftung Sachsen-Anhalt. Under the special category ‘Academy Positions’, Kunststiftung Sachsen-Anhalt presents works from two scholarship recipients. Nina Hannah Kornatz’s paintings and objects revolve around the theme of sport as a media spectacle. Top 2013 features ten brightly coloured football fan-style scarves brandishing the names of ten contemporary artists, taken from the well-known KunstKompass yearly ranking of important artists. The work parallels the ideas of spectacle, celebrity, and commercialism between sport and the art world. 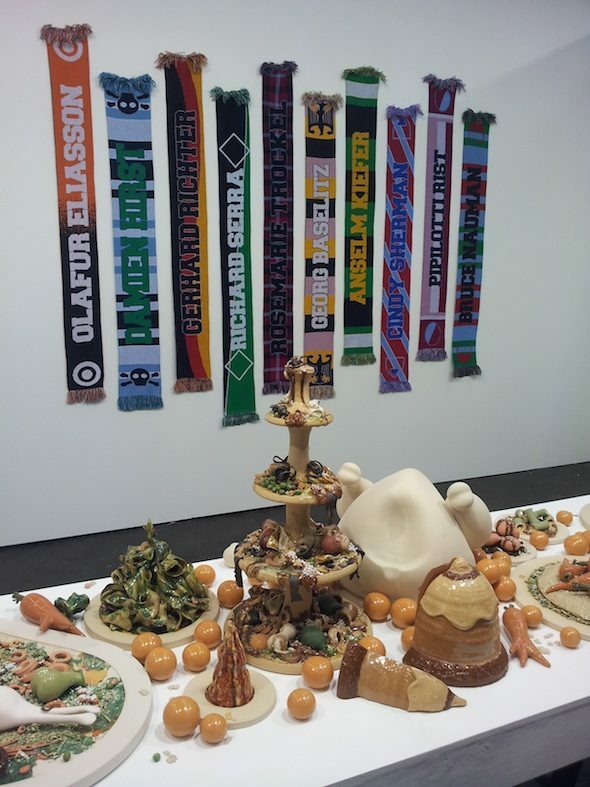 Marie-Luise Meyer creates intricate ceramic sculptures of food that are both decadent and repulsive. The table spread appears like a fantastical banquet from a children’s book with imaginary cakes, pies, and piles of stripped bones from a roast. On a closer look the glossy oozing ingredients and scattered remnants look more like a scene from a disturbing dream. Klaus Frahm, “The Fourth Wall” (2014), photograph. Copyright Klaus Frahm, courtesy Amrei Heyne gallery. 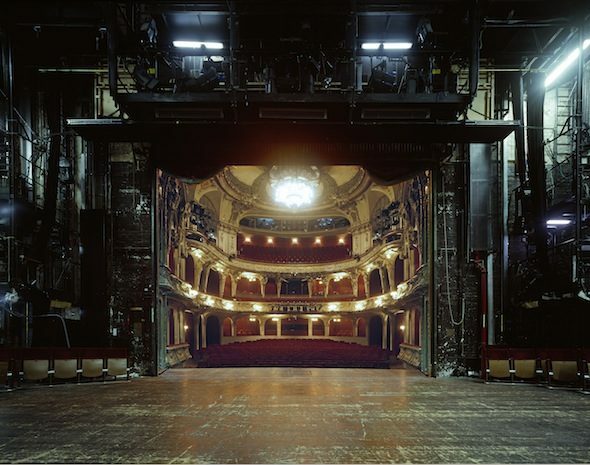 Klaus Frahm photographs Europe’s grand theatres from a surprising and unfamiliar perspective. From a viewpoint deep on the stage, the series The Fourth Wall presents a view that reveals the enormous hidden spaces behind the curtain. Looking back at the empty extravagant interiors of the seating area, in warming lit rich reds and golds, they appear like backdrops or small windows like looking into a puppet theatre. The vast space of the audience is reduced and flattened by the contrast, playing tricks with perspective. Heike Jeschonnek, “Die Künst zu überleben Joseph Beuys” (2015), wax an oil on cardboard, 100 x 150cm. Courtesy of Tammen & Partner. Marion Eichmann creates three-dimensional drawings by collaging paper cutouts and small found objects onto the surface of her drawings. From a front on view the works appear like flat prints, with bold lines and flat colour, but close up the surface is alive with texture and shadows. Coloured facets and lines jump out and give the everyday objects a dimensionality, though a fragmented and fragile one. 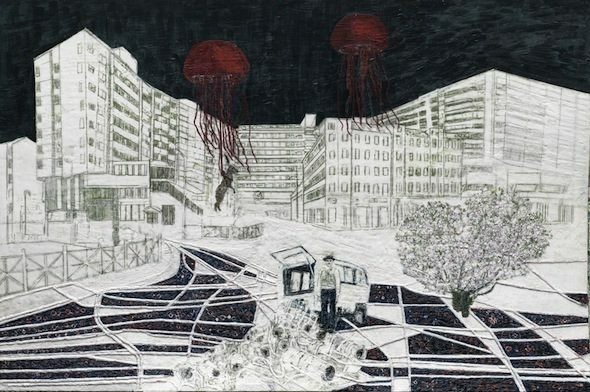 Heike Jeschonnek also creates depth with her surfaces, with her use of paraffin wax and oil and cardboard. Brushwork on top of the waxy surface is foregrounded, whereas lines behind or smudged into the wax are subdued and pushed into the distance. Jeschonnek combines perspectival line drawing with surreal and abstract forms. The thick translucent wax defuses the lines and the scenes become subtly hazy like a dream or memory. Blog entry by April Dell in Berlin; Saturday, Sep. 19, 2015.